You will earn 2,055 Reward Points. Earn 1 reward point for every 1 dollar spent. 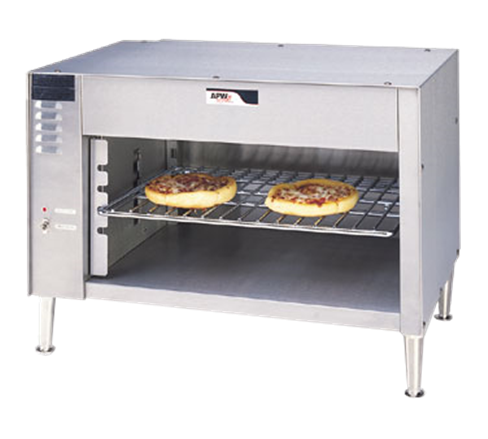 This unit is constructed of stainless steel with 4” heavy-duty legs as standard, on Counter Mount and Pass-through models. Top, sides and back (except pass-through model) are fully insulated with high quality insulation. Special designed control allows unit to maintain standby level with 25% of heating capacity. Unit has four shelf height “micro switch” that is activated by placing a plate on the shelf, which provides ultimate finishing capabilities. All controls are solid-state with electrical fancooled compartment. Infrared heaters are easy to snap-in and out. All hardware is stainless steel. All units are single phase. Top, sides and back (except pass-through model) are fully insulated with 1” of high quality insulation. When the master switch is “on”, the unit stays “on” at 25% of heating capacity. The 48” model has one unit “on-off” switch and one red unit “on” light. There are also right-half heater “on” switches and right and left “on” lights. Use half, or the entire unit as needed.